"Let it snow, let it snow, let it snow." I really don't wish for snow in the south. We are really not equipped to handle snow. A small snow storm will shut us right down in Georgia. I do like "the white stuff" though, not the snow , but white drums. 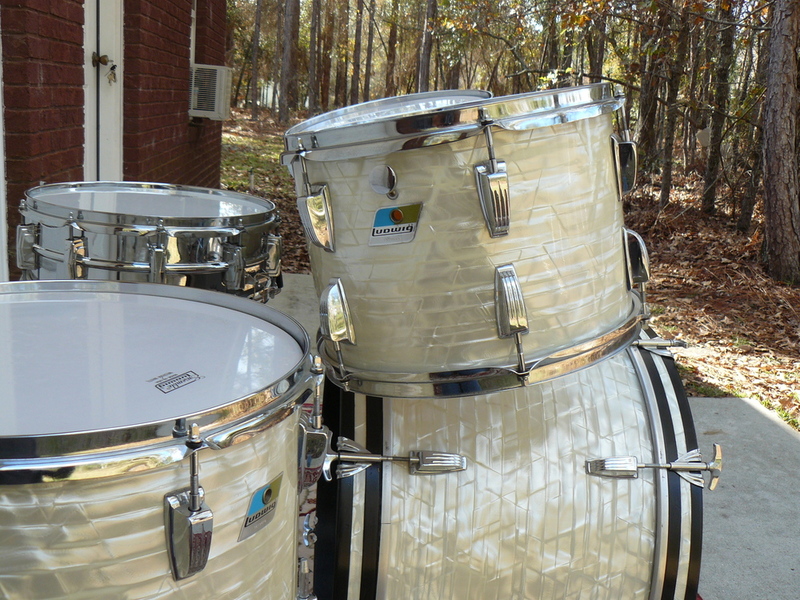 I just love white drums for some reason. 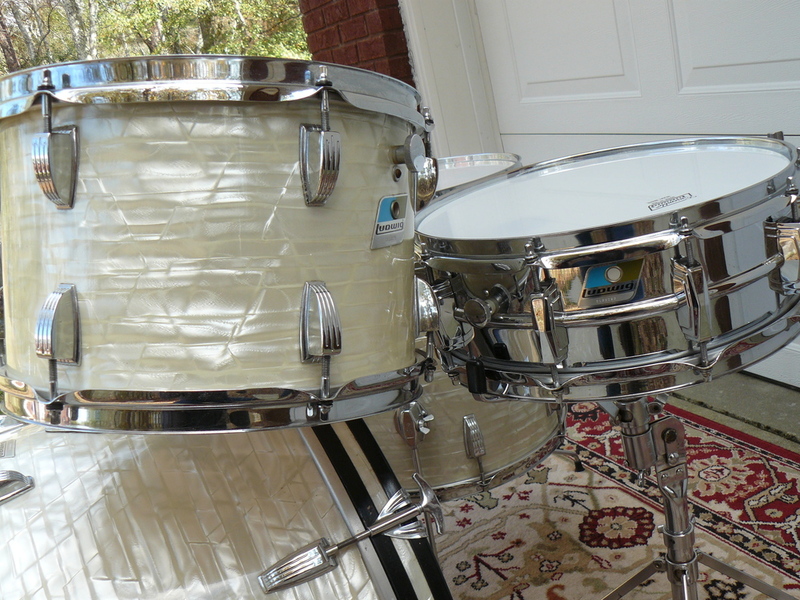 I especially like Ludwig's white marine pearl finish. I think the reason I like them so much is because most of the "greats" like Krupa and Rich used drums with white pearl finishes. White pearl drums always look classy to me. They look right at home with a big band or a jazz trio. They even look nice with a country or rock band. 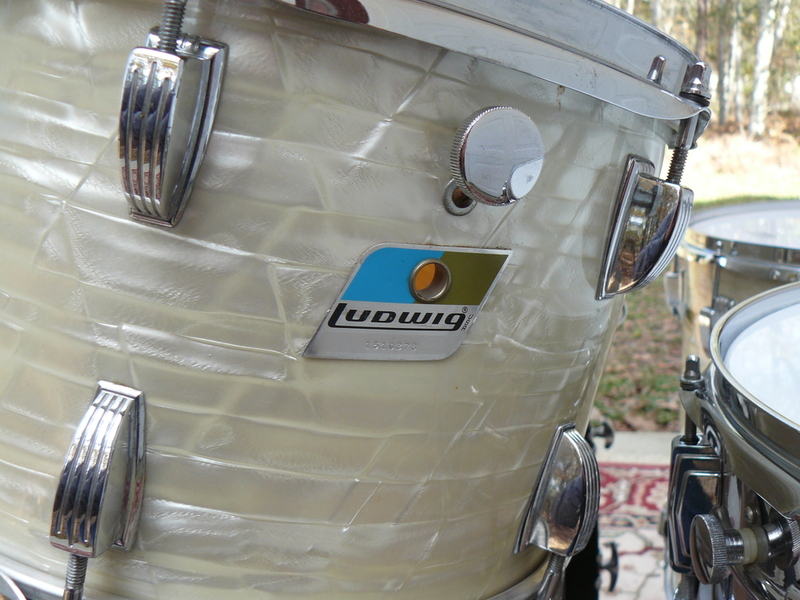 I have a beautiful 1970s Ludwig Big Beat set to show you this month. They are so nice and I really love the way the white marine pearl finish has aged. White pearl will often yellow with age. I know many drummers prefer their white pearl to be really white. I agree white pearl looks great when it is very white. 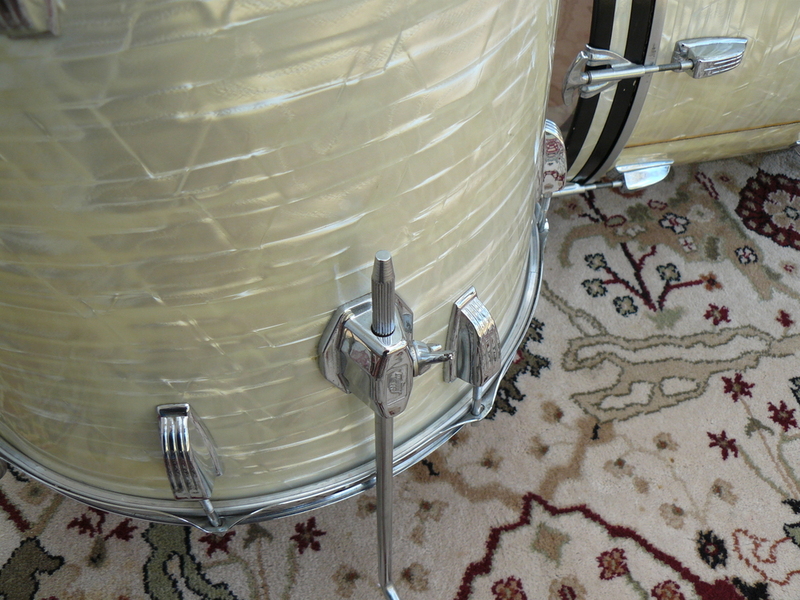 Some collectors want to clean the yellow off their white drums as much as possible. It is possible that the yellow on the finish is just a build up that can be cleaned away with some hard work. There are a lot of suggestions to remove the yellow from white pearl. I would suggest that the finish should be cleaned and then left as is. 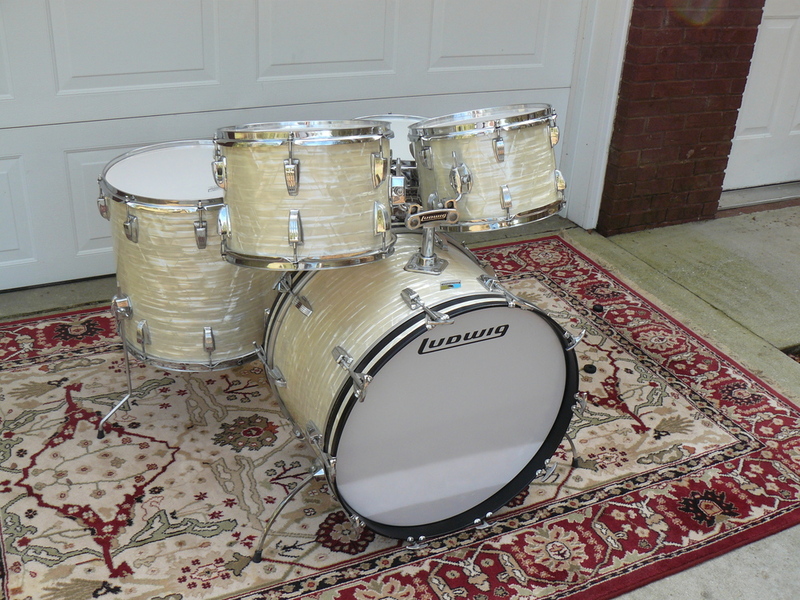 The natural aging of the white pearl finish is beautiful. 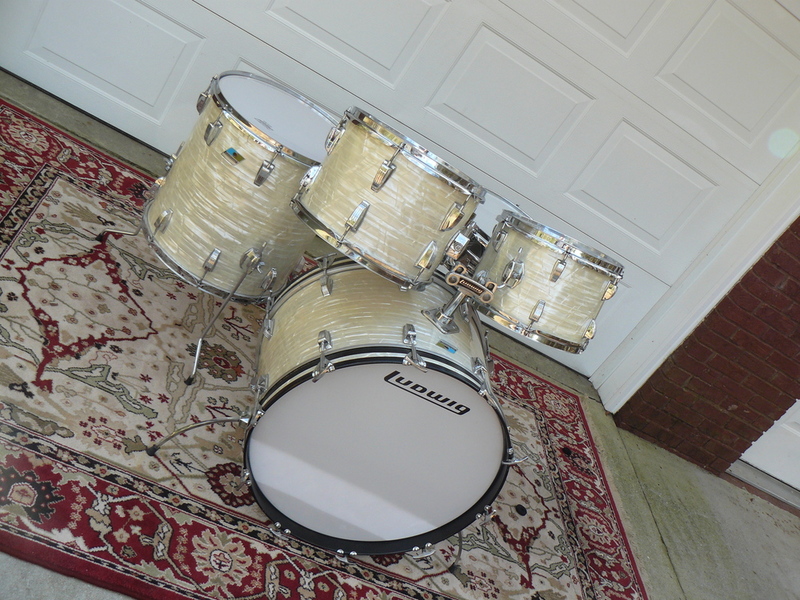 Ludwig has introduced a "new" yellowed white pearl finish for their top of the line drums. My white marine pearl set is from the 1970s and has the Blue and Olive badges. Tell me please why Ludwig put the badges on the back of the drums. It is a mystery to me why they didn't put those badges out front. I heard that Cozy Powell had Ludwig re-install the badges out front on his drums. The bass drum is a 22"x14", the floor tom is 16"X16", the mounted toms are 13"X9" and 12"X8". 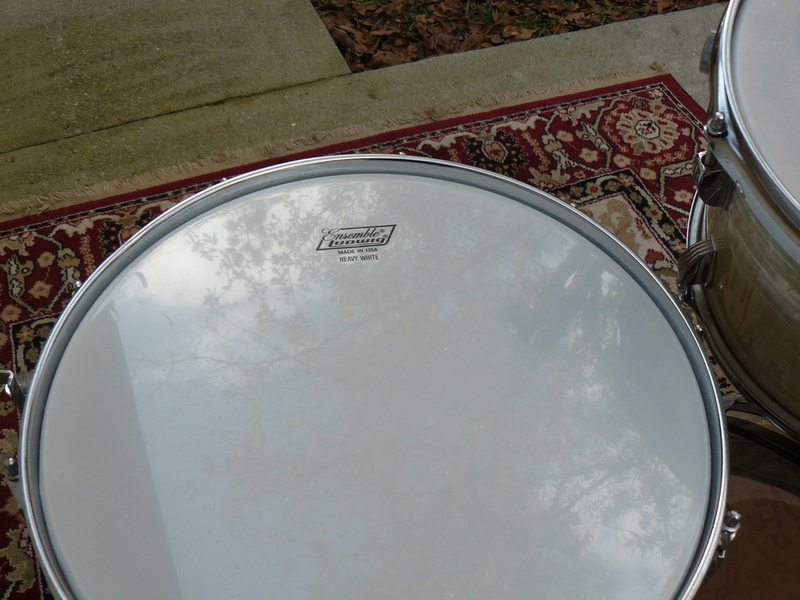 The chrome 14"X5" Supraphonic is the snare provided with most of these sets. The interiors of these drums are clear coated. The smooth heads are original to this set and have "Ensemble" printed on them. This kit is in very good to excellent shape. I don't think they were used very much. Age has made the wrap shrink at the seams just a bit. the chrome is super nice. 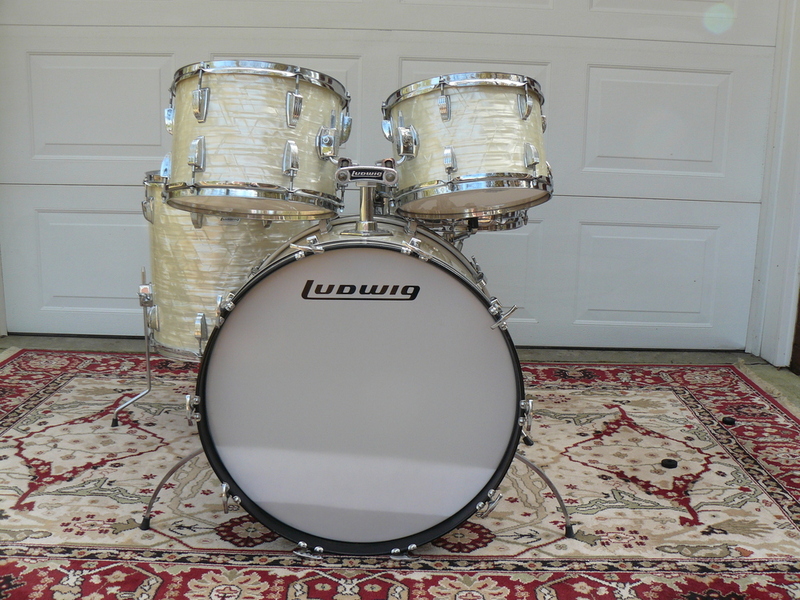 They tune up nicely and have a great sound that you would expect from a Ludwig kit. Bill Pace, my old friend found these drums at a piano shop. He called me to see if I wanted them as soon as he picked them up. I suppose someone had traded them in on a piano. I guess drumming isn't for everyone, and we do need a few piano players. In fact, I think we need more piano players and bassist and less guitarists, but that's none of my business. I took piano lessons as a child and wish I had stuck with it. I just felt like playing the drums was so much more fun, and you know, I was right about that. Drumming is fun. I want to wish you and yours a very happy holiday season. I hope you get some fantastic drums for your present this year. Let me know what you get.